A personal account of a job interview held at Apple Park appears to paint a picture of the new headquarters' inner workings, from staff docents to iPad-powered coffee dispensers, in intriguing detail. Briefly published to Reddit before being deleted from view, the recent post from a throwaway account talks about a prospective hire being interviewed for a position on the Mac team. While the author does not discuss what happened during the interview itself, they do cover the experience of visiting the campus for the entire day. On arrival at the Tantau Avenue reception center, the writer was checked in and provided with a green visitor's lanyard, which also identified their host for the day. They were then instructed to follow a path to the main building, one that is obstructed by hills and the path itself before offering a "spectacular view of the side." 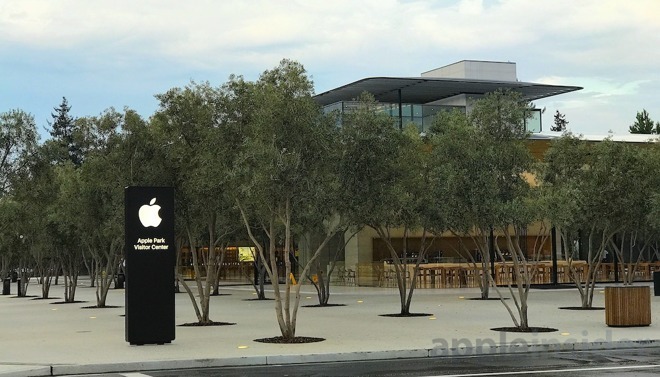 Two sets of employees welcomed the individual, with blue-shirted Apple Security personnel accompanied by green-shirted "greeters," who acted as guides in a similar way to front-of-store Apple retail employees directing customers to other store staff. Informed the building was quite confusing, "especially for guests," the poster notes they received assistance from a number of the green-clad employees to the appropriate area. Checked in by another greeter at Apple Park Section 1 and asked to wait in the lobby, the writer remarks the area "looked custom made and very new," complete with comfy couches and beanbag chairs. Guests also had access to a pastry bar and coffee at the location. The coffee stations are noted as having a "Moen faucet" style spigot that contains four smaller hoses, used to dispense hot, chilled, and ambient temperature water along with freshly brewed coffee. The station was controlled by an iPad, which offered to dispense coffee in a user-specified quantity, selected by a slider. Nearby was a "small but well-staffed cafe" that provided espresso drinks and pastries. According to the writer, each of the nine sections has its own coffee station and cafe, separate from the main dining area. The interview room is described as being made from wood, but one with small 1 to 2 millimeter holes across the surface used for ventilation. As the world's largest naturally ventilated building, the writer noted they did not see any air vent grates, while the ceiling of the room was made from granite. The room also had a circular table, chairs, a glass whiteboard, and a soft LED light strip that ran along the middle of the wall along the sides. The glass walls facing the hallway had motorized blinds for privacy, rather than the author's expected use of frosted glass. Two hours into the interview process, the writer was walked to another section of the ring for lunch, ordering from the app-based Caffe Macs menu. The low-cost food is reportedly similar in quality to that offered at Caffe Macs at Infinite Loop, but the experience of eating has apparently benefited from Apple "building the place to accommodate thousands upon thousands of people per day." The main dining area is described as sizable, both in terms of floor space and with a ceiling taking advantage of the size of the building, complete with ample natural light and trees within the dining space. Sitting on a third-floor balcony to eat, the author was able to look out onto the campus' inner ring, calling it "honestly breathtaking." Following lunch, interviews continued for another four hours. Potential employees are warned that a 6 to 7-hour interview process is "the norm," so to expect spending an entire day going through the process. While the original post about the visit was posted on Thursday, the entire post was removed and the associated account deleted hours later. It is possible that the author removed it due to the risk associated with publishing details about Apple's headquarters affecting their chances of getting the job they interviewed for, a probable conclusion considering the comments below the now-wiped post. Numerous commenters advised to take down the post, suggesting it would be against any signed non-disclosure agreements, and that it was highly probable someone at Apple would have read the post and identified the author. Despite the anonymous nature of the post, numerous elements of the article match up with the experience of one AppleInsider contributor's own visit to the campus, suggesting it to be a factual account. Descriptions of the food, coffee stations, and the iPad-based menus correlate with what was seen on that occasion, as well as the heightened security and the attention to detail in building and decorating the working environment.